Friday marks the first full year of Bureau of Labor Statistics Employment Situation reports since the beginning of the Trump administration. Put simply, overall economic growth and the labor market are healthier today than they’ve been in years, and President Trump and his supporters have been quick to claim credit for this relative health. These are ridiculous claims. An analogy might help. A person’s health is a function of many variables: genetics, diet, exercise, and environmental factors, for example. Eventually, of course, almost everyone will at some point in their life need access to quality medical care to remain healthy. But, noting that somebody is healthy at a given point in time says nothing about whether their doctor is competent or not. 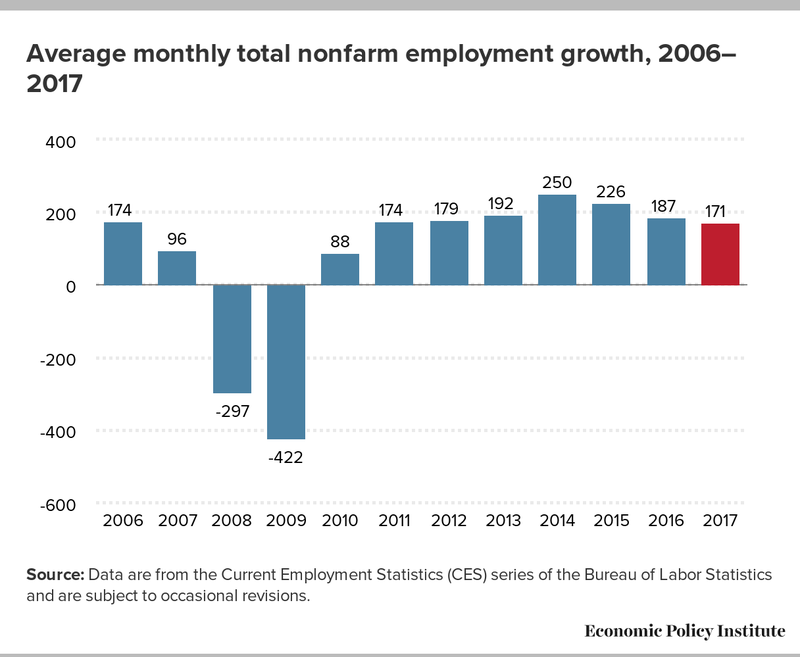 The Trump administration was handed an economy and a labor market whose health had improved radically (if too slowly) over the preceding eight years, and which was trending steadily in an even better direction. Macroeconomic trends tend to have lots of momentum, so we shouldn’t be shocked that this recovery has continued. But nothing the Trump administration has done has boosted its trajectory. 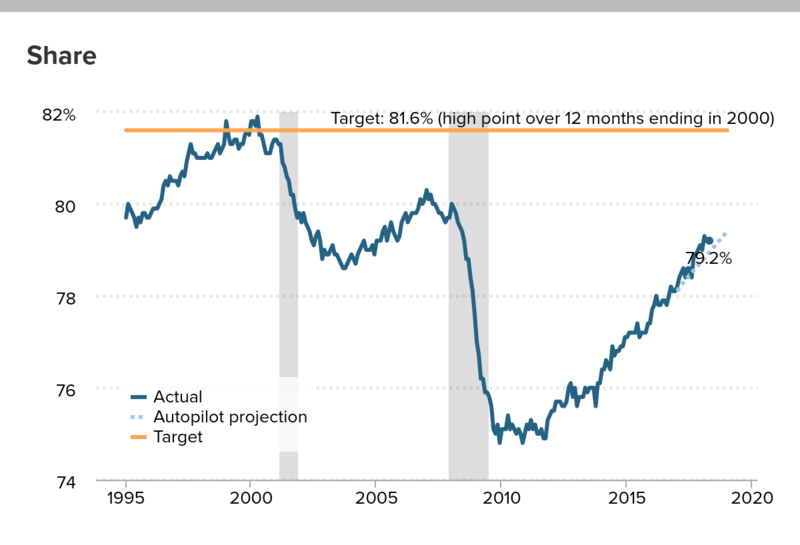 Friday’s jobs report will give us an opportunity to look at the last year in the context of what we would have expected from an economy that was completely on autopilot, just moving along its preexisting trajectory. EPI’s Autopilot Economy Tracker focuses on four key measures: the unemployment rate, the prime-age employment-to-population ratio, wage growth, and payroll employment growth. Here I’ll take each in turn—I’ll look again on Friday to see what story the newest data tell. The overall unemployment rate continued the downward trend it has been on since its peak in 2010, hitting a business cycle low of 4.1 percent in 2017. EPI’s autopilot tracker predicted a fall to 4.0 percent by 2019. So far, the unemployment rate is mildly beating autopilot expectations. The figure below disaggregates the unemployment rate by race and ethnicity. 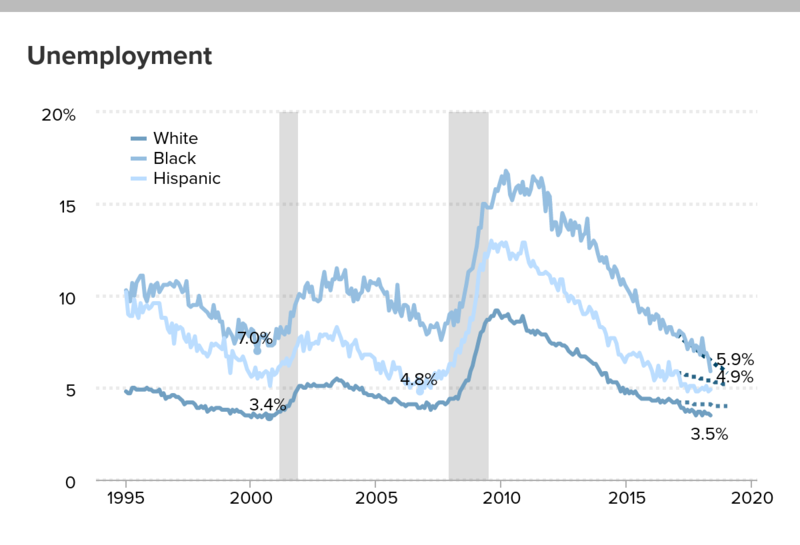 While the monthly data for these sub-groups are quite volatile due to relative small sample sizes, the tracker suggests that the white non-Hispanic and Hispanic (any race) unemployment declines also slightly exceeded pre-2017 trends. However, the much touted black unemployment rate of 6.8 percent is right on track to what an economy on autopilot would have yielded given recent trends. One potential reason why unemployment declines have been faster than pre-2017 trends is that before 2017, labor market improvements could have been registering partly in improved labor force participation and falling involuntary part-time employment. If these margins are adjusting less as the economy gets healthier, the unemployment rate will be the primary way labor market strength registers. This speculation about other margins of adjustment (besides falling unemployment) soaking up some of the labor market improvements of pre-2017 years is given a bit of support when looking at the prime-age employment to population ratio (EPOP)—the share of the 25-54 year old population with a job. The prime-age EPOP is increasing on track with preexisting trends. Contrary to what some analysts claimed at the time, as the economy strengthened more and more would-be workers have entered or reentered the labor force in search of job opportunities. The Great Recession was deep and workers and their families were deeply hurt across the economy, but increasing opportunities have continued to pull workers back in, and it is increasingly clear that they have not been permanently “scarred” by the recession. Nominal wage growth remains the troubling sore spot in the economy today. As the labor market tightens, we generally expect to see significantly stronger wage growth, but wage growth has been flat over the past year, actually doing significantly worse than pre-2017 trends predicted. At this point, the EPI autopilot tracker predicted we’d be seeing 3.0 percent wage growth, but over the past year wages have risen just 2.5 percent. It is clear from this wage data that while today’s labor market is healthier than it has been in years, it has not yet achieved full health. Until it does, policymakers need to let the recovery continue without restraint. 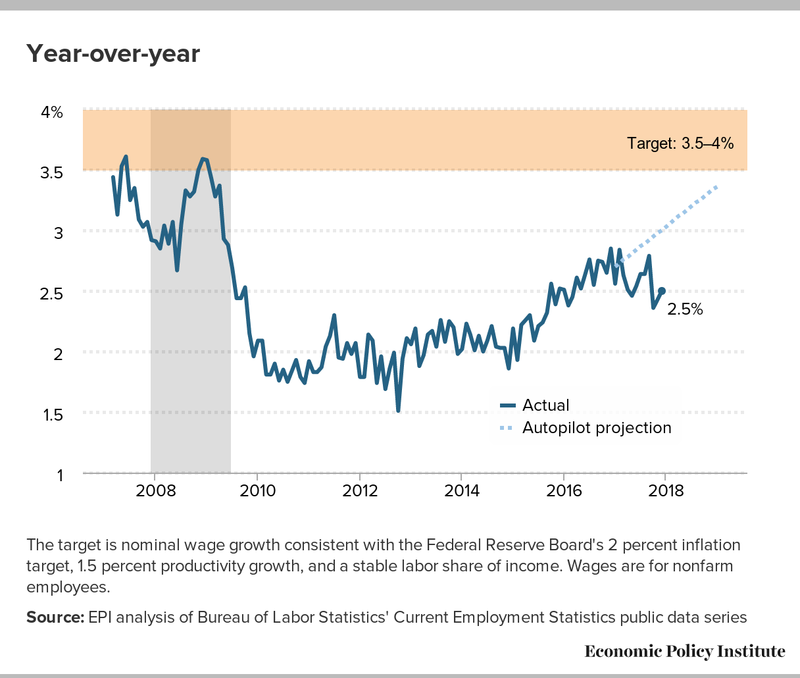 The target is nominal wage growth consistent with the Federal Reserve Board's 2 percent inflation target, 1.5 percent productivity growth, and a stable labor share of income. Wages are for nonfarm employees. Lastly, I turn to payroll employment growth, illustrated in the figure below. December’s number was considerably weaker at 148,000, but even the year average fell flat. Over the last year, payroll employment growth averaged 171,000—mildly slower than 2016 and considerably slower than 2014 and 2015. According to President Trump’s own prediction of 25 million jobs in the next 10 years, the economy would need to add an average of 208,000 jobs per month. All in all, yes, the economy is healthier now than it’s been any time before the Great Recession. But it’s not completely healthy, and, more importantly, there has been no boost at all to the pace of recovery over the past year. Put really simply, the Trump administration deserves no credit at all for today’s relatively strong economy and labor market—they simply inherited an economy that had been getting stronger each year since 2010, and have so far managed not to knock it off this path. Source: Data are from the Current Employment Statistics (CES) series of the Bureau of Labor Statistics and are subject to occasional revisions.